We have had a few ho-hum days after the shot across the bow with the Dubai Caper a week ago, and as I pointed out in my last blog note, the market has hit its head against an Immovable Object of 1111 on the S&P 500. Net-net, we are back to playing Snakes and Ladders and even the most seasoned of Day Traders are cautiously looking for any clue as to whether they should go short or stay long. Given the dismal volume it seems that many have even decided to move to the sidelines to wait for a definitive signal of which way the wind is blowing. Yesterday we had a second shot across the bow with Phoenix yet again after the Dubai one, so caution is the word of the day. 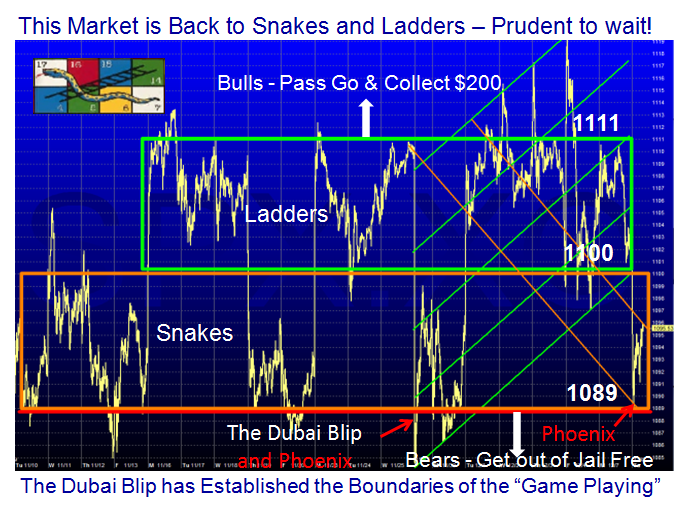 The Dubai Blip set the parameters of the current playing field and as you can see from the chart below of the S&P 500, it is stuck in a tight Darvas Box from 1089 to 1111, with 1100 conveniently being the half-way Line in the Sand. Until there is a breakout to one or the other side of these two numbers, the Market will continue to yo-yo every two to three days in a trading range. Only very short term players need apply, and Type 3 and 4 Players can snooze. 5. At 64% up from the Base Low, the S&P 500 is now at initial Viagra Rally levels. The Bottom Line is the Bulls win if we move up with momentum above 1111, and the Bears will at long last Get Out of Jail Free if it goes below 1089. The second Phoenix yesterday says the Bears have control so watch out until we see an Eureka…The RoadMap to Hog Heaven is still working! 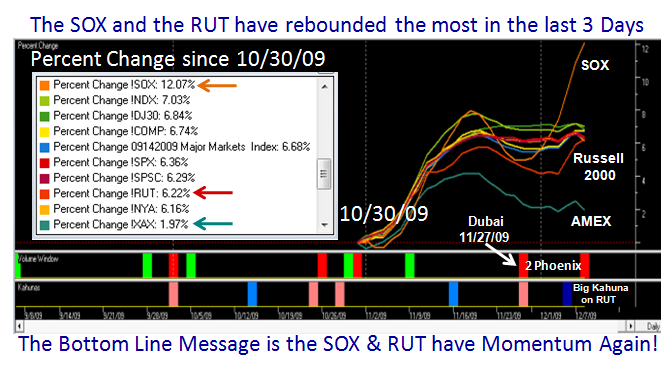 This entry was posted on Wednesday, December 9th, 2009 at 10:29 am	and is filed under HGS Principles, Market Analysis. You can follow any responses to this entry through the RSS 2.0 feed. Both comments and pings are currently closed.